The alimentary system of birds can be harmed by several pathogens, among them yeasts. There are some typical situations in which Candida spp. occur in a birds' crop, stomach or bowel. If the immune system is weak, yeasts often have a walk-over. Such immune system disorders can be caused by several factors such as the moult or stress. Also after a treatment with antibiotics, yeasts can show up. Antibiotics fight bacteria - and they don't tell apart good from bad bacteria. So they also kill the "good" bacteria and disturb the intestinal flora. Once there is an imbalance, yeasts can spread. This kind of disease is called a Candidiasis or a thrush. Typical symptoms are exhaustion, fatigue, loss of appetite, wet droppings (diarrhoea), vomiting, and loss of weight. If a bird throws up its food, in many cases the mucus smells sourly. And in some cases one can see that a birds' crop is swollen. This happens because Candida spp. are gas-forming. The photo on the right shows this phenomenon. As you can see, the crop looks like a "balloon". In an advanced state of the disease, birds can show numbness, disturbance of equilibrium and even palsies. This happens because yeasts produce so-called mycotoxins. These toxic substances attack the inner organs such as the liver and the central nervous system. Please note: Not all the above mentioned symptoms may occur in each individual case! 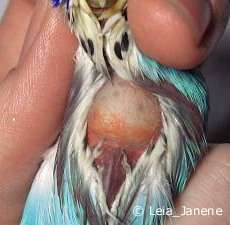 It is necessary to bring your bird to a vet who will examine the feathered patient. By taking a smear from the crop or cloaca the vet can identify the pathogens and find out if you have to deal with yeasts or with other pathogens. A Candidiasis won't heal by itself. It is important to get the right medication from a vet. Candida spp. can be treated with drugs containing an agent called Nystatin. There are several different oral suspensions available. The therapy will take at least one week; in many cases even much longer (up to four weeks). 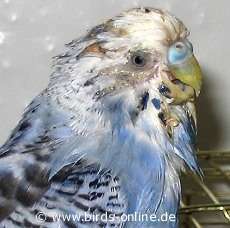 During the treatment your bird should not eat sugar, because the yeasts nourish on it. And please note that fructose is the same as sugar - your little patient is not allowed to eat any fruit during the therapy. Please ask your vet about the special diet for your bird. Sometimes another kind of mould fungus can be found in a birds' crop: Mucor spp. This pathogen can also lead to vomiting and other above mentioned symptoms. To get rid of Mucor spp. it needs other drugs such as Itrafungol. Yeasts can also lead to fungal skin infection. They cause itchiness and the birds can't stop scratching themselves. If your bird throws up all his food again and again, a bacterial infection of the alimentary system may be the cause. Also the so-called going light (avian gastric yeast) can be the reason why your bird is ill.